If you have ties to the University of Arkansas at Fayetteville, you may want to include Razorback embellishments in your scrapbook pages. Whether you use these decorative elements to show local pride, demonstrate affiliation to the football team at the university, or simply to decorate scrapbook pages from your college years, these embellishments are widely recognizable within Arkansas and surrounding states. 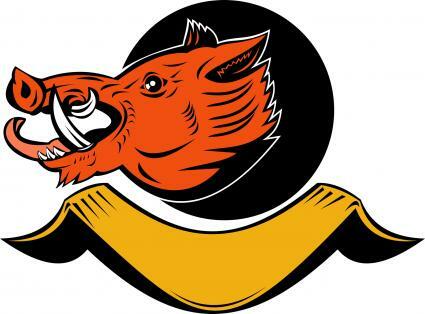 The football team of the University of Arkansas uses the razorback as its mascot. Razorback is actually a word used only in the United States; in other regions, the same animal is called a wild boar or a feral pig. Whether you call him a razorback or a feral pig, Tusk, the mascot of the football team in Fayetteville, Arkansas, is a symbol of strength and perseverance, and is famous within the state. For scrapbookers, Razorback embellishments are a great way to personalize University of Arkansas themed layouts. Scrapbooking embellishments add greater detail and dimension to your layouts. Whether you enjoy digital or traditional scrapbooking, there are a variety of Razorback designs that can take your pages to the next level. If you prefer computer scrapbooking, you can use colorful digital embellishments in the form of .JPG or other image files. You can use digital embellishments to make electronic pages, or you can print out your designs in color to put in a traditional scrapbook. If you love traditional scrapbooking, you can find a great variety of pre-printed embellishments, such as stickers, picture frames, borders, and three-dimensional cutouts. You can make or purchase these items to add to paper scrapbook pages. Take a picture of Tusk at a football game and using your computer software, crop the picture. You can then insert it into any digital scrapbook page you create. Take a picture of any place where a Razorback is featured, such as on the scoreboard, on a local sign, or even on a ticket to a game. Keep in mind that the original Razorback digital graphic is a copyrighted image; for this reason, you should not edit your picture to include only the copyrighted graphic because this is an infringement of copyright laws. Download vector images from websites such as iStockPhoto. While this is not a free source, you can use the graphics you have paid for on an unlimited number of scrapbook pages. For those who do traditional scrapbooking with printed pictures, stickers, patterned paper, and borders, there are also plenty of Razorback embellishment sources. You can make your own embellishments with the help of your camera or purchase custom University of Arkansas paraphernalia from various websites. Take pictures of Tusk or anything with a Razorback on it, such as a t-shirt or a mouse pad. Print these pictures, cut them to the exact size you want, and use them to accent pages of your scrapbook. Buy Razorback wall paper, wall paper borders, book covers, or wrapping paper, all available from Amazon, and cut out the sizes that you need. Cut an entire sheet of paper (either 12 x 12 inches or 8 1/2 x 11 inches), and use it as your paper base. Alternatively, cut out a single hog and glue it in a key location on a scrapbook page. With these materials, some scissors, and photo-safe adhesive, the possibilities are virtually endless. Buy stickers, scrapbook paper, and borders from scrapbook supply stores. Try out items like the Razorbacks scrapbook kit from Crafter's Market, or Razorback themed scrapbook items available from eBay sellers. Make your alma mater clear on graduation themed pages with a Razorback or two. College days can look like a lot of fun when you use sports team related images to create a carefree college atmosphere. You can bring homecoming and football game pictures to life with pictures or images of Tusk. Instead of displaying brightly colored leaves or depictions of the wind blowing through the trees, use images of the Razorbacks to spice up seasonal pages showing fall events. No matter how you use your Razorback embellishments in your digital or traditional scrapbooks, the football team mascot of the University of Arkansas at Fayetteville is an easily recognized symbol that will brighten and personalize your pages.